The College of Charleston is honored to host an NSF-CBMS conference on Topological Methods in Machine Learning and Artificial Intelligence, during the week of May 13-17, 2019. We are pleased to announce that there will be a one day workshop on Software for Topological Data Analysis immediately following the conference on Saturday May 18, 2019. 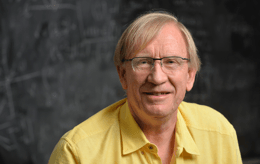 Professor Gunnar Carlsson of Stanford University and Ayasdi Inc. is our Principal Lecturer. He will deliver a series of ten lectures introducing participants to the fast emerging field of Topological Data Analysis. Dates: Conference May 13–17, 2019, followed by the workshop on Saturday May 18. We gratefully acknowledge funding for the CBMS Conference from the National Science Foundation, Award Number DMS 1836362 (PI Ben Cox, Co-PIs Anna Calini, Bob Mignone). We thank a private donor for generous financial and scientific support for the Saturday workshop. A series of ten lectures in the mornings and early afternoons, afternoon working groups, discussion periods and team modeling sessions. Opportunities for socializing will be plentiful. We especially encourage participation from early career researchers, graduate students, minorities, and women. Morning talks by library authors on implementation details and challenges for TDA software. Afternoon coding sprints led by experts, at various of levels of coding experience.